Hi friends! Today I have a sweet makeover for you! Nothing fancy, but it was in good shape and for $15 I figured at the very least I could paint it. But then just as I was dozing off I had an idea! I really need to put a post it pad under my pillow because that always happens. I did paint it, but I also added drop cloth rosettes to it! 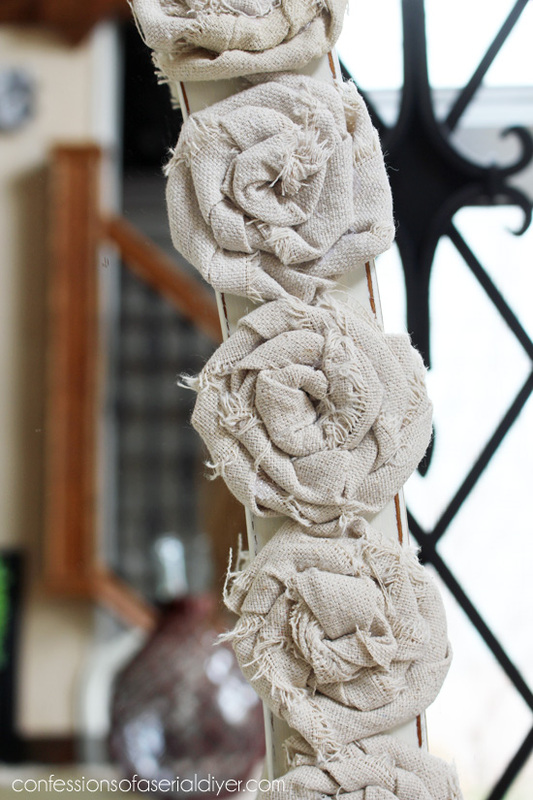 I made the same rosettes I used on my Mini Drop cloth Rosette Stool Makeover. I made a video on how to make them if you’re interested. 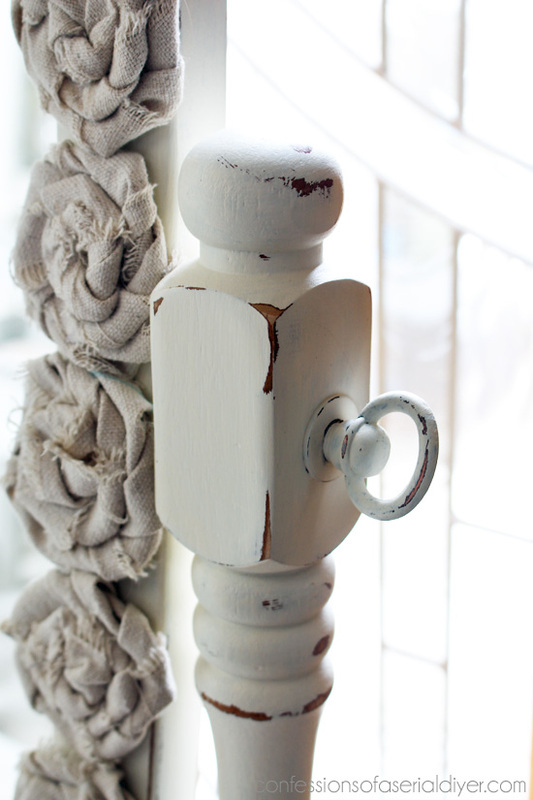 After painting in Cottage White (Behr) DIY Chalk paint, I sanded and waxed with Annie Sloan clear soft wax. Then I used hot glue to attach the rosettes. Caught my sweet kitty snoozing. This is one of her favorite spots. It’s the last Friday of the month so you know what that means? 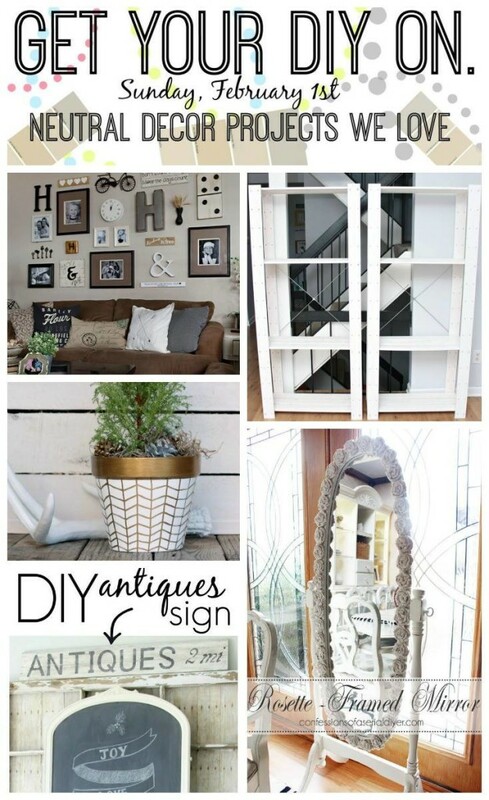 This makeover is for our Get Your DIY On Party! If you’re a new follower, welcome!! You can follow the link to find out more about our monthly party. 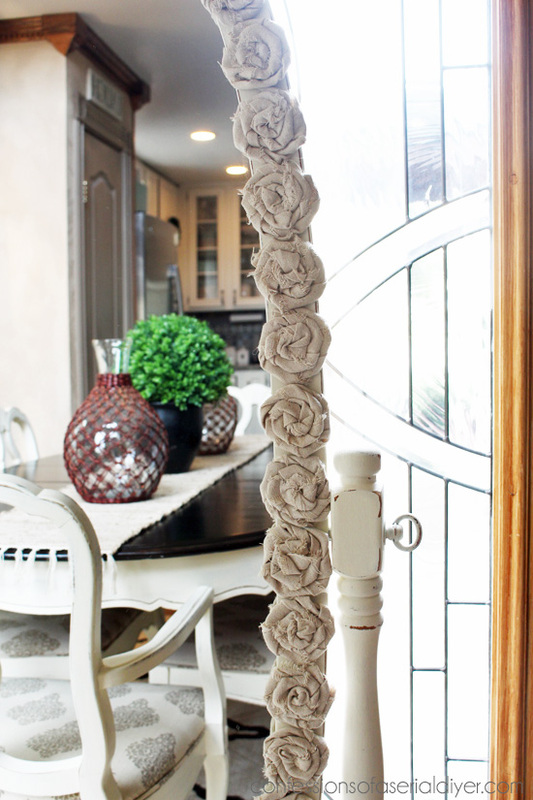 This month’s theme is Neutral Décor Projects we Love! My mirror is neutral and I love it. Perfect! The party fun starts this Sunday, February 1st, at 7:00pm EST. I love how this turned out. 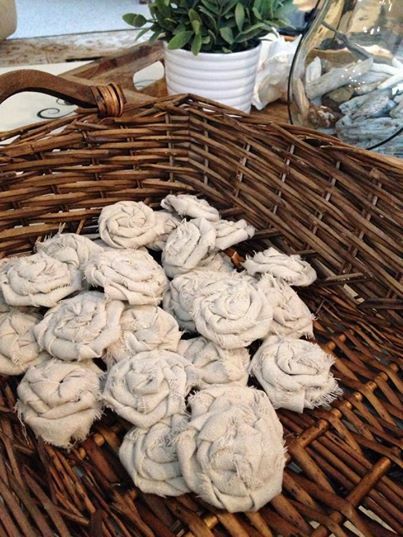 I have been wanting to try to make your drop cloth rosettes ever since I had read your post about the stool makeover. I hadn’t gotten around to making them yet, but seeing this newest project of yours inspired me to put it at the top of my craft “to do” list. 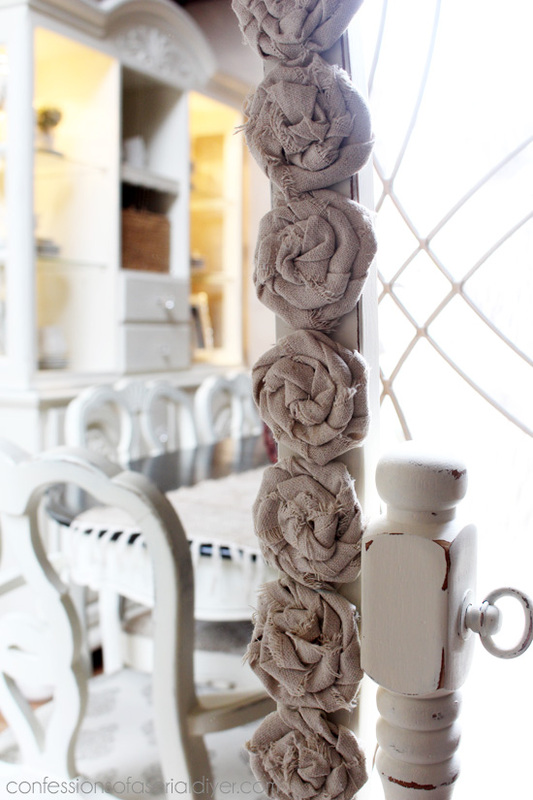 I just happen to have some spare drop cloths, so I might have to make some rosettes this weekend. Yes I saw that yesterday.. I really like the shabby vintage look to them! So cute. And yes I have gotten so many blisters from hot glue, use with caution definitely. 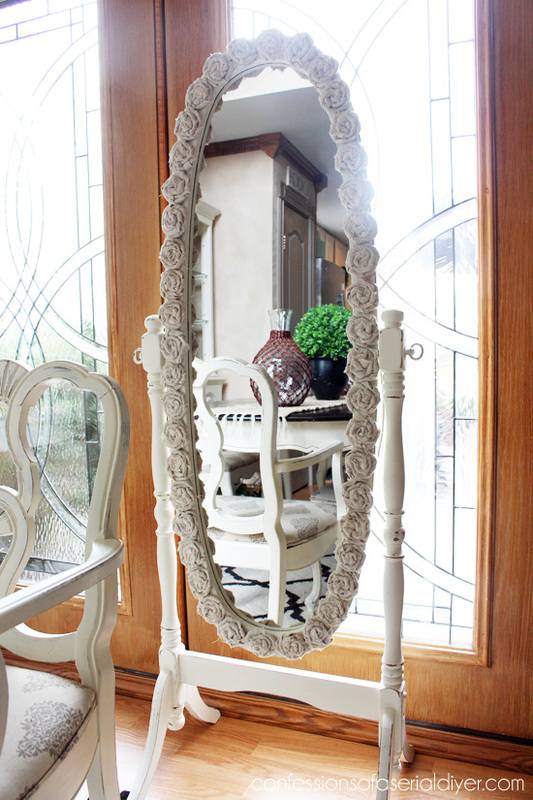 Love the mirror, so sweet! I have 3 girls and they would love a mirror like that. I am going to have to try this project! 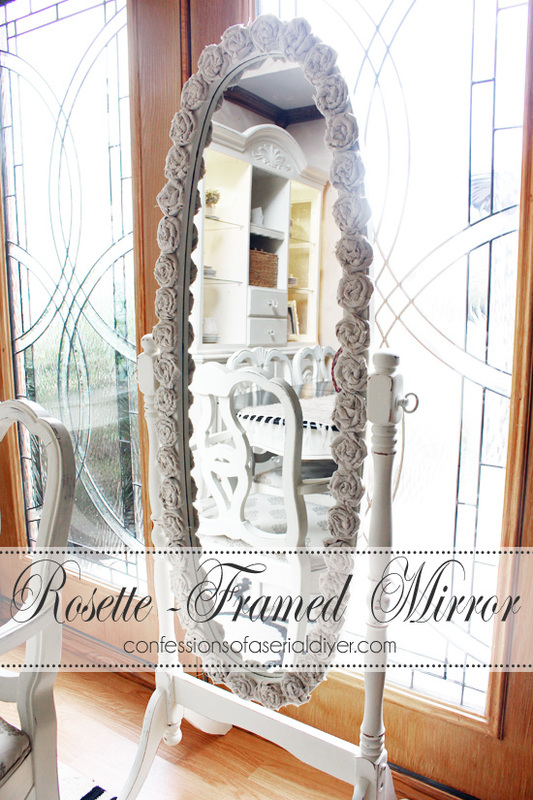 Love the rosette mirror!! Would be great for a little girl’s room. LOL your dryer buzzing during the video!! Your creativity astonishes me Christy. That mirror is gorgeous with a capital G! I love this! When you first shared your rosette stool I planned to make one and then forgot about it till today! I will definitely be making one soon! Thank you for all your great ideas. It’s adorable, Jen…..I wish that I never sold mine a few years back! Thanks, JP! Too bad you don’t still have yours! This is top notch creativity.The mirrors and the video are excellent.Thanks. 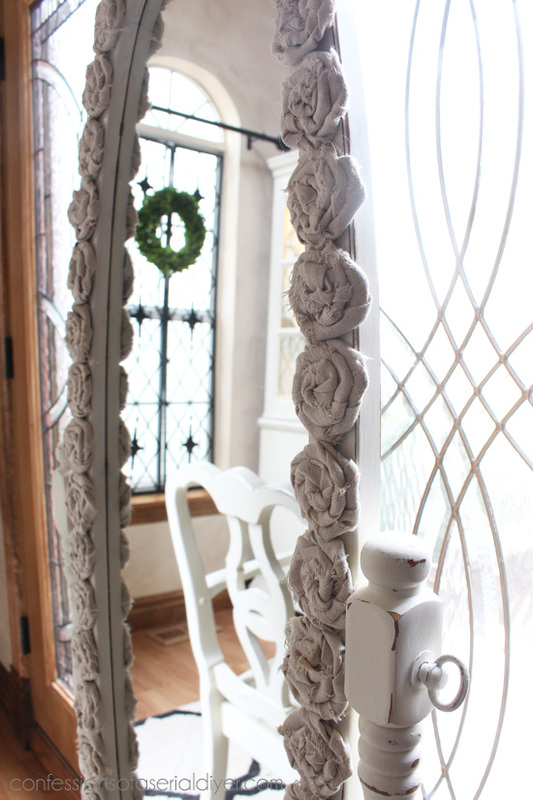 What a beautiful way to add some charm to a mirror! It would be absolutely adorable in a little girl’s room…hmm, when my little girl is a bit older this may just have to happen! This is the sweetest mirror of all time!!! 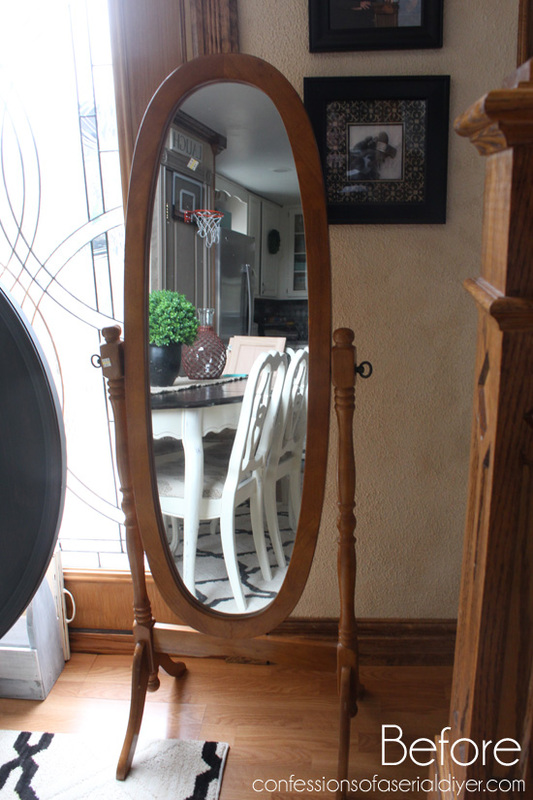 What a unique way to give this mirror a romantic look. I can definitely see it in any girl or woman’s room. Great idea! Wow, this turned out excellent! 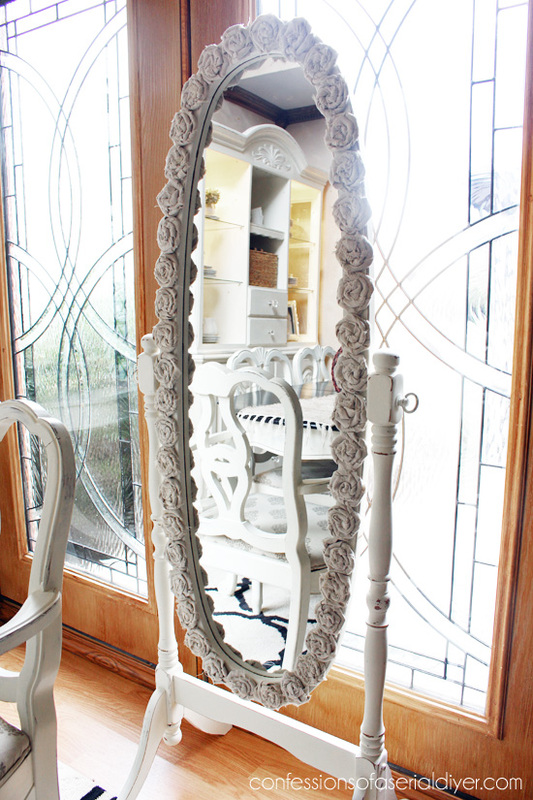 I love the mirror painted white, too! It looks so soft and feminine! LOVE this!! So gorgeous! 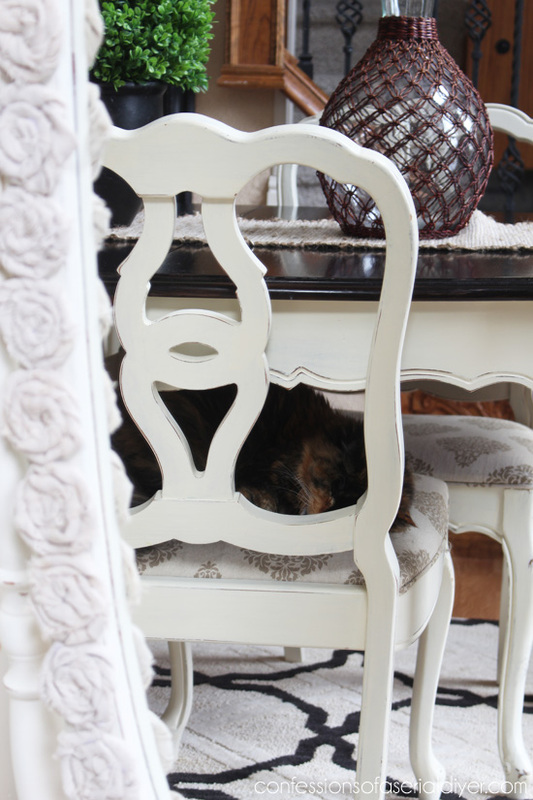 Thanks for linking up at the Ladies Collective Linkup! 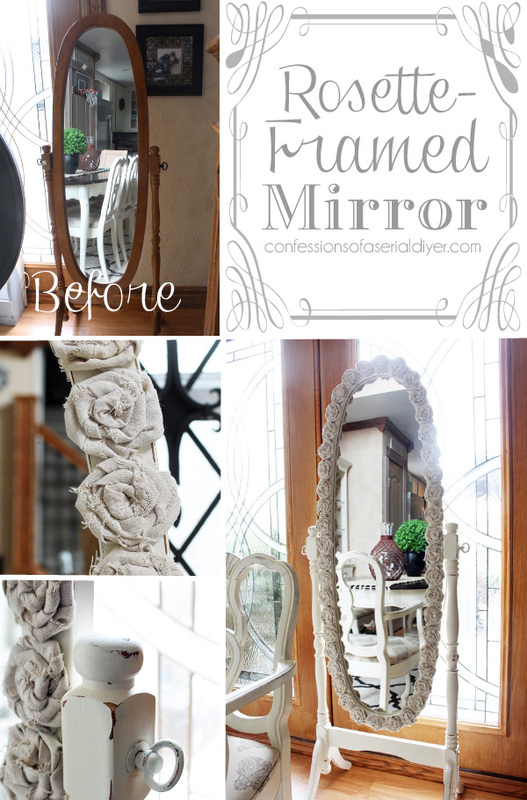 Love this….I have a mirror similar to yours and have been trying to think of some way to make it look better…..thanks for sharing this!! !